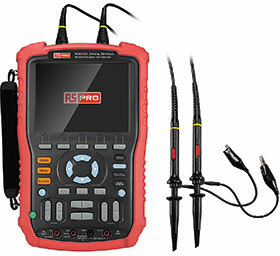 The RS Pro RSHS800 series handheld digital oscilloscope has dual-input features such as an oscilloscope, multimeter and recorder with trends and waveform functions all in one instrument. There are four different models to choose from with bandwidths of 60, 100, 150 and 200 MHz. These instruments offer high performance and have the flexibility to be used in workbench and field applications. This device weighs 1,5 kg with dimensions of 260 x 163 x 53 mm and has a rechargeable battery pack which is compact and a portable fit for outdoor operation. It features a voltage through BNC up to CAT II 300V and CAT III 150V with a standard probe 10X CAT II 400 V. The oscilloscope and multimeter safety grade is up to CAT II 600 V and CAT II 300 V and has a 5.7 inch TFT colour LCD display. The 1GSa/s real-time sampling rate single channel, has up to 50 GSa/s equivalent sampling rate and a 2 Mpts memory depth and offers a Scope TrendPlot, Meter TrendPlot and a Scope Recorder. This handheld digital oscilloscope can be used for various applications such as outdoor measurement, automotive electron testing and for education and science research. It is supplied with a USB cable, quick start guide, product qualification certificate, multimeter pen (1000 V), 1:1 / 10:1 probe (1 per channel), CD (containing EasyScope PC software), and power adaptor.